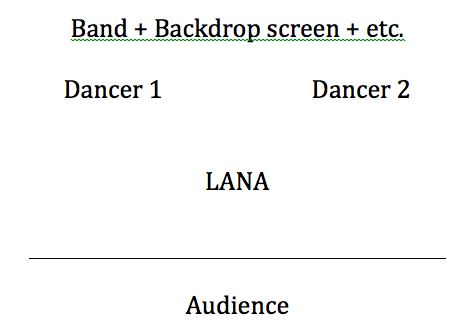 Does anyone else feel like Lana's choreography, and backup singer/dancers just feel awkward? Lana moves likes she's embarrassed. Wish she would just go back to standing there. It felt more honest. I feel that way too. I'm not really a fan of the back up dancers but I think they were put there in the first place to make the performances more 'exciting'. I think it's cute and hot when Lana starts dancing with them lol. I feel like lana doesn't really like dancing while singing and she kept the dancers cause she couldn't say no ..it's ridiculous but.. Dancers are stupid. She's not a dancer it doesn't look natural. Also don't crucify me but her voice has been OFF the past two performances. I didn't see the full videos just clips but she's off tune. Also she was headlining huge festivals last year. Why is she doing these small festivals, 20 min shows, and not even headlining?? Those barbie arms during Off to the Races are pretty awkward to be honest. You guys are always doing the most. Lana doesn't look anymore uncomfortable and awkward than she's always done. Also, I actually love the dancers. I think they add a lot to the show and I disagree that they seem out of place. They totally fit the 60's girl group aesthetic she's going for. the weird rapid arm movements during ottr are an unmitigated disaster. 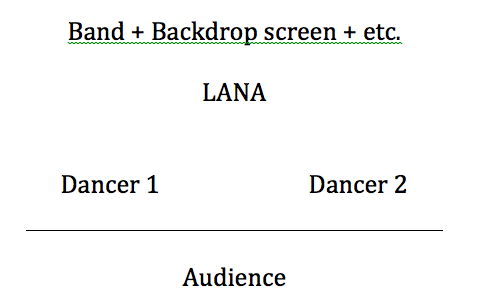 the rest of the dancing isn't as repulsive but it makes the whole show seem rigid and takes away the magic imo. what i always liked about lana's live performances was how relaxed and real they were. The dance is cute, we know that dancing is not one of her strong skills. I was also smiling, when she said they needed weeks to learn it. I was dancing for 10 years, and this can be learned in hours. But somehow it fits with her I think, with all the awkwardness. Lol, I thought the same thing, I know how to dance to Cherry after only seeing it once or twice. xD Anyways, I think she's still not used to dancing and singing at the same time, hopefully she'll become better the following years (or ditch the moves and just go back to singing).